In the last few weeks I’ve been talking with a colleague about magnetizable materials – what they do and how they are categorized. I’m talking about things such as iron – which, when you put them in a magnetic field, will magnetize. That makes the field bigger than you started with. 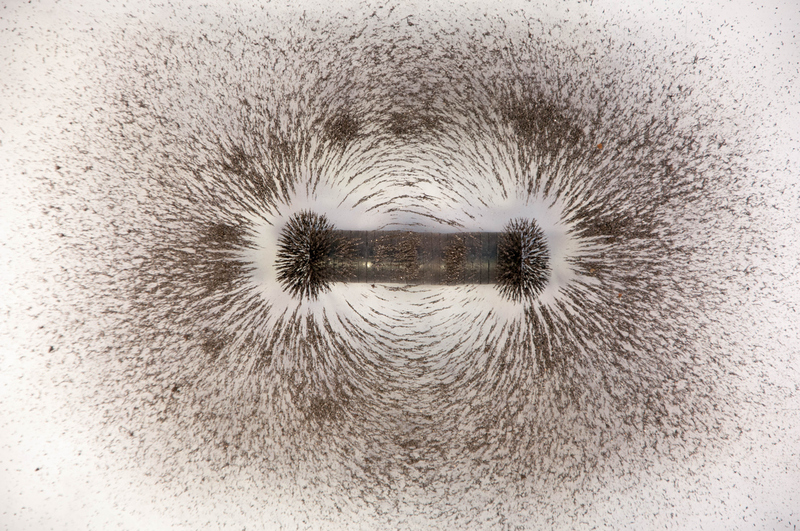 Some materials will stay magnetized when you take them out of the external magnetic field (these are called ‘hard’ materials – nothing to do with their physical toughness), and some won’t (or will only weakly – these are called ‘soft’ materials). One of the properties that characterizes a magnetic material is the ‘relative permeability’ – often given the Greek letter ‘mu’ with a suffix ‘r’ for ‘relative’. It tells us (sort of) how much a magnetic field will boost by, compared to air, if you use a magnetic material instead of air. Now, reading the undergraduate textbooks, (certainly the general ones focused on first-year) one would be forgiven for thinking that mu_r was just a scale factor you could multiply by to get the field in an object. For example, if you knew that a coil of wire with a certain current gave a magnetic field of 0.1 tesla, and you had a lump of magnetic material of relative permeability 100, then if you put that lump in the coil the field by the lump would be 100 times 0.1 = 10 tesla. No. Two problems (at least). First, the relative permeability is never a constant. As the field strength increases, relative permeability will plummet. No way are you going to get to 10 tesla. But there’s a more fundamental problem. First-year textbooks often present unrealistic hypothetical examples. The favourite is the infinite solenoid – a coil of wire of infinite length. There’s a very good reason why this is presented – because you can do the maths! Now, in this case, if you insert an infinitely long magnetic rod inside the coil to totally fill the space, the magnetic field will indeed boost mu_r times – so what was 1 tesla will become 100 tesla in our example. But this is a hopelessly stereotyped example. One never has a core of infinite length. In practice, fields are going to be much less. In fact, one other situation (go to third-year undergraduate texts or above) which CAN be solved exactly is what happens when you put a magnetizable sphere inside a magnetic field. The result is surprising – when mu_r is large, the boost in the field will come to 3. No more. Our 0.1 tesla field boosts to 0.3 tesla. That’s because the sample doesn’t cover the entirety of space. My point here is that textbooks can, in their effort to create solvable mathematical problems in physics, bypass what is physically reasonable and create misconceptions. One could say the mistake actually is to think that it is the mathematics which is important. Here at Waikato, we’ve just run a first-year paper ‘Physics in Context’, that has been designed to be accessible to the least mathematically-able science student. We’ve followed the paper closely, with some research that will be presented at an upcoming conference on the Australasian Association for Engineering Education, and I can confidently say that our students have learned the physics. But they didn’t need the much maths to do so. The post The problem with undergraduate textbooks… appeared first on Physics Stop.